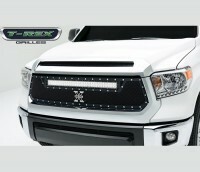 6319641: 14-17 Toyota Tundra (All models except 1794 Edition) Torch Series X Metal Custom Mesh Chrome Studded Grille with Single LED Driving Light. Comes complete with hardware and instructions. Replaces OEM factory grille. Installation time is about 1.5hrs. Backed by manufacturers limited lifetime warranty. Made in USA. Built in super bright LED driving light bar (center) 30" long, 15Amps, 180Watts, 14400 Lumens.